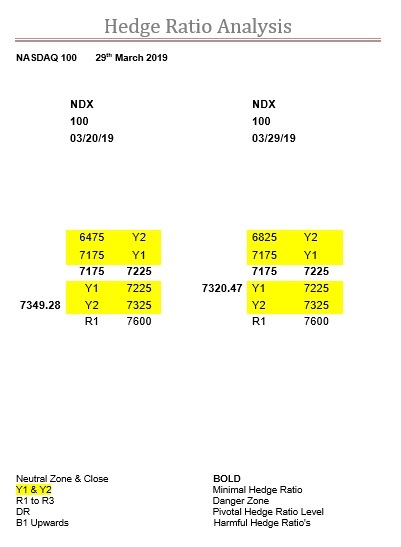 Again, we wish the table above for the NDX had been published back on the 20th, as just like the SPX and the DJX there were significant ratio levels that had to be contended with. For the NDX it was right from the very start, as on that very first day this index closed right on Y2 at 7325. And 7325 has been the constant theme for the past two weeks, and if you knew it was where Y2 was, and hence all that futures activity, then the last two weeks would have made a lot more sense. Monday 18th the close was 7326.28, next day’s intraday low was 7321.93 having opened nearer 7360. Wednesday’s intraday low was another test, being 7318.42, then it tried to break free, but as you can see the ratios were just not shifting, so by Friday it was back to Y2 with the close at 7326.06. Of course, that was the day it dumped 167.21-points, so it probably would have been nice to know, that just like London, it was an accident waiting to happen. Although, having fought through the hard yards, it is worth pointing out, and please see our previous commentary on this subject, that the Thursday immediately before this big dump, the DJX was hitting the top of their zone, intraday high 26009, and the SPX was meddling with R2, with their intraday high of 2860.31. This week, 7325, has been significantly involved as well, suffice it to say Monday’s close was 7316.96 and yesterday’s 7320.47. Nevertheless, at the end of the day, here we are at the midpoint of this expiry, which incidentally, closes a day early, and the ratios are still seriously underdeveloped. So, just like the DJX, if this index gets a head of steam up, which is very possible in the run up to the rollover and expiry, it really could motor. However, with R1 lurking up at 7600, and Y2 now in-between, it will find life a lot easier going south than it will north, but the bulls have already set out their stall, getting it as high as 7505.41, so they will have to be taken out first, and with the lack of ratio meaning a general lack of interest, that may not be so easy in itself.